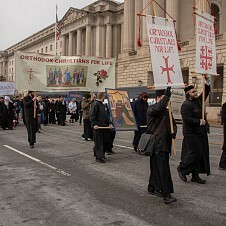 Sunday, April 10th, Matins 8:00 a.m., Divine Liturgy 9:30 a.m., Parastas 6:00 p.m. for the newly departed Stephen Malec. Monday, April 11th, Funeral Service 9:30 a.m. for the newly departed Stephen Malec. Wednesday, April 13th, Presanctified Liturgy 6:30 p.m., Confession 5:45 p.m.
Thursday, April 14th, Great Canon of St. Andrew of Crete 6:30 p.m., Confession 7:00 p.m.
Akathist to the Most-Holy Theotokos 6:30 p.m., Confession 7:00 p.m.
Saturday, April 16th, Divine Liturgy 9:00 a.m., Great Vespers 6:30 p.m., Confession 6:00 p.m.
Sunday, April 17th, Matins 8:00 a.m., Divine Liturgy 9:30 a.m.
We extend our love and sympathy to the family of the newly departed Irene Swirdovich and to the family of the newly departed Stephen Malec. May their memory be eternal! Ethnic Food Sales at St. Michael’s Center will be held this Friday April 15th, 12 (Noon) - 5 p.m. Factory orders are welcomed. For advance orders call Ruth at 876-1456. 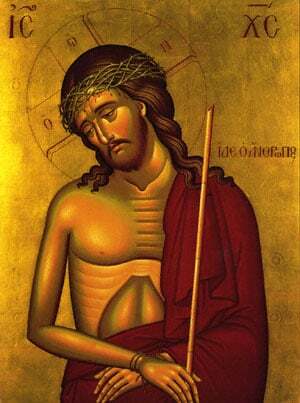 Sunday Mission Vespers will be held this afternoon at 4:00 p.m. at St. John’s Orthodox Church in Dundaff. Adult Education Presentation: “ 10 suggestions for Great Lent ” will be held this Wednesday, April 13th, following the celebration of the Presancfited Liturgy. Pot-Luck Lenten Meal will be offered. Please see Millie Telep during Coffee hour and let her know what you will be bringing. Special Donations: $50.00 offering for Easter Flowers from the Lasichak family for continued good health. 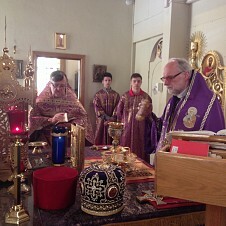 Church School will be held on Sunday, April 17th, following the Divine Liturgy underneath the Church. Please make every effort to bring your children to Church School. Church School Breakfast will be held on Lazarus Saturday, April 23rd, following the celebration of the 9:00 a.m. Divine Liturgy. Easter Baskets will be presented to the Church School Children. Please plan to attend! Hospitality a la Russe featuring Traditional Russian Cuisine with the Kauriga Balalaika Orchestra will be held on Sunday, May 15th at St. John’s Russian Orthodox Cathedral in Mayfield, 3:30 p.m. Reception & Russian Table, and Theme Basket Drawing. Hostesses: Sunday, April 10th: Millie Wanas, Marilyn Petorak, Maryann Serafini; April 17th: Karen Wanas, Matushka Dolores Petorak, Mille Telep; April 24th: Dorothy Allen, Debbie Bernosky, and Ann Butler.